Can you recall the last time you felt bloated, gassy, abdominal cramping, diarrhea or constipation? For most people, these symptoms are mild and once in a blue moon, but for people with Irritable Bowel Syndrome (IBS), there is no cure for this gut disorder and these symptoms are chronic issues that can disrupt the quality of life. The great news is that you can help manage your symptoms through nutrition! When people think of gut symptoms like those mentioned above, one of the most common suggestions is limiting irritating food triggers like caffeine, alcohol, and fatty foods, as well as increasing fiber intake and fluid intake. However, when dealing with IBS, since these gut symptoms are broad and can vary from person to person, managing them with a one-size-fits all approach is not ideal. While there are various treatment suggestions for those suffering from IBS, following a low-FODMAP diet is the new nutrition therapy approach in town that has the potential to manage symptoms in most people with IBS. Last month, we were fortunate enough to attend the Nutrition Grand Rounds at New York-Presbyterian Hospital to learn more about FODMAPs and their potential benefits in the treatment of IBS. The presentation featured two speakers Dr. Julie Khlevner, M.D., an expert in pediatric gastroenterology who oversees the new Pediatric Gastrointestinal Motility Center at NewYork-Presbyterian/Morgan Stanley Children’s Hospital, and Patsy Catsos, MS, RD, LD, author of the book IBS – Free at Last!. While Dr. Khlevner and Patsy both discussed treatment options for people with IBS, each speaker touched on very different areas and treatment options. Dr. Khlevner explained the process of testing, diagnosing and treatment in children and young adults. In terms of treatment options, Dr. Khlevner suggested keeping a food log, keeping an eye on trigger foods, taking probiotics, as well as IBS hypnotherapy. Patsy educated the audience on a food-based approach to treating IBS and the potential benefits of this dietary therapy. Patsy Catsos explained dietitians play a starring role in the management of IBS. A high fiber intake has been a common recommendation for treating IBS symptom management, however, research has found that few people find the increased fiber to be helpful. Thankfully the use of FODMAPs has been becoming increasingly popular in the management of IBS symptoms and with a relief in symptoms. In fact, evidence has shown a FODMAP-elimination diet to reduce symptoms in 3 out of 4 people with IBS1. These symptoms often greatly impact a patient’s quality of life, especially in children and adolescents. Treatment for IBS can vary greatly per patient; however, common treatment options can include the use of probiotics, increased fiber intake, pharmacological interventions, psychological therapy, and lifestyle and dietary modifications. How do FODMAPs affect IBS? The origination of IBS symptoms can, too, be caused by a number of factors, some including, chemicals found in packaged foods, such as nitrates or sulfites, as well as FODMAPs. The ingestion of FODMAPs are not the cause of IBS, rather what can trigger the troublesome symptoms like abdominal pain or bloating. Patsy spoke about the use of FODMAP elimination trials in patients with IBS. This idea behind FODMAPs is that when people with IBS consume sugars that their body can’t properly breakdown, it contributes to their symptoms. The FODMAP approach includes a 1-2 week elimination of all FODMAPs, which Patsy called the Elimination Phase. The FODMAPs are then reintroduced into the diet one at a time to allow for proper monitoring of the patient’s tolerance. It can help you determine which sugars you may be sensitive to, and what foods to limit in quantity or what foods to avoid altogether. And yes, there is an app for that! The research team at Monash recently launched a smartphone application: The Low FODMAP Diet. The app provides a list of hundreds of foods using traffic light signals i.e., (Red = Avoid and Green = Eat without fear) and according to serving sizes since smaller portions may be better tolerated. 1. Scarlata K. The FODMAPS Approach – minimize consumption of fermentable carbs to manage functional gut disorder symptoms. Today’s Dietitian Website. Available at: http://www.todaysdietitian.com/newarchives/072710p30.shtml. Published August, 2010. Accessed April 16, 2014.
Who Owns That Health Food Company? Do you have a favorite food brand that you constantly buy? We all have our go-to, tried and true brands that we stock in our cupboards and pantries. Maybe your favorite brand is a classic like Progresso breadcrumbs or Hunts tomato products. Or perhaps it’s a smaller brand like Alexia Foods or Happy Family Foods. We all pick the foods we purchase based on different reasons. Some of us decide depending on the price of the food, the ingredients, the nutrient content, or even the company’s mission and values. Take natural food brands for example, they advertise their efforts to only choose natural and wholesome ingredients, maybe they’re organic or don’t contain GMOs. And who doesn’t love the idea of supporting a company that gives back to the community? Odwalla Smoothies and Juices – listed under brands on the Coca-Cola website. Coca-Cola purchased Odwalla in 2001 in an effort to compete with rival company, PepsiCo. Vitamin Water – listed under brands on the Coca-Cola website. Hunt’s Tomato Products – Hunt’s wears the label 100% natural on the majority of its products. It is listed on ConAgra’s list of brands. Alexia Frozen Foods – Alexia Foods also totes the 100% natural label. They are also listed on ConAgra’s list of brands. ConAgra was sued earlier this year when customers questioned the company’s “all-natural” labeling and their use of a chemical to prevent browning in their potato products. The case settled. Food Should Taste Good – This company was acquired by General Mills in 2012 as an addition to it’s Natural Snack Food Business sector. The founder of Food Should Taste Good, Pete Lescoe, continues to act as the company’s creative director. Larabar – Larabar is listed under General Mills’ brands on their website. A letter written by Lara, the founder of the acquisition of the company can be found here. The site also states that Larabar remains 100% committed to their values. Happy Family Brands – their site states their partnership with Group Danone earlier this year. Stonyfield Yogurt – According to a press release on Dannon’s website, Group Danone acquired 40% of Stonyfield Farm in 2001, with Gary Hirshberg remaining as active CEO, chairman, and President. Group Danone currently owns Stonyfield Farm and Gary Hirshberg has since resigned as CEO, but remains an active chairman. To put these lists in perspective, we wanted to share The Cornucopia Institute’s 2013 Organic Industry Structure chart. 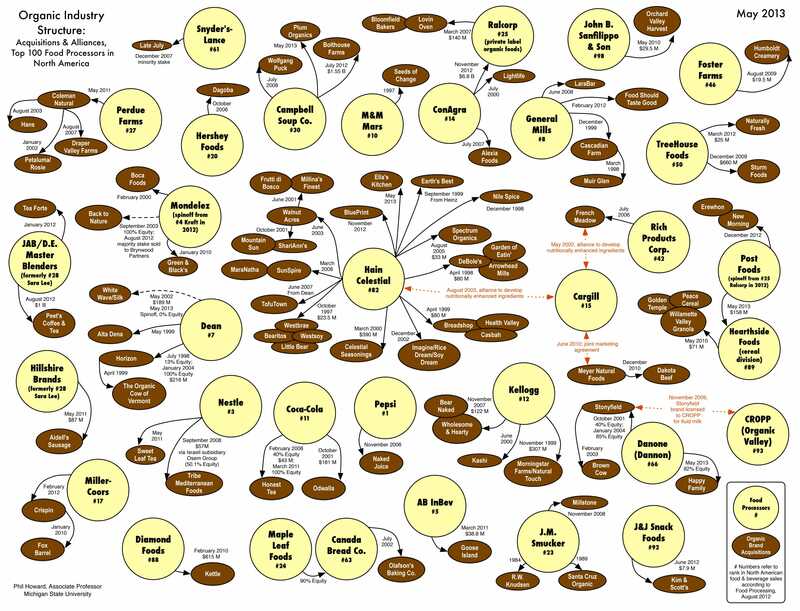 Their newly updated chart has grown immensely from their 2008 Organic Industry Structure chart. Were you aware that these small companies are owned by larger food companies? Will this change your choices the next time you go to the grocery store? Tell us your thoughts below. Should Your Oil be Cold-Pressed? If you read our previous post on canola oil, you most likely know that picking an oil for your family meals isn’t the easiest task. There are many factors when choosing an oil: the heat index, the content of unsaturated vs. saturated fat, and even the question of genetic engineering. Not to mention the fact that there are over a dozen of choices in most grocery stores! Let’s start with smoke points. Every oil has a smoke point, or temperature, where the oil begins to break down. When the oil breaks down, it can lose some of its benefits and gain an unpleasant odor. The trick is to avoid allowing the oil to smoke and if it does, you want to restart your dish with a new serving of oil. *For a more detailed chart on fat content in oil click here1. When walking down the aisles at the grocery store, not only do you have to pick from a number of different oil options, but you also have to consider the processing that oils undergo. For a quick guide on the best ways to use cooking oils, see Cleveland Clinic’s Top Heart-Healthy Oils Guide – it’s a great go-to resource to have in your kitchen. 1. Duyff, Roberta Larson. The American Dietetic Association’s Complete Food & Nutrition Guide. New York: J. Wiley, 1998. Print. Prostate cancer is the second most common cancer among males, following skin cancer. It is currently most common in men over 50 years of age. An estimated 1 in 5 men will be diagnosed with cancer. Prostate cancer involves the prostate, an organ associated with the male reproductive system. We spoke last week about breast cancer and wanted to continue to raise the awareness of our EALM readers by covering the ins and outs of prostate cancer; including nutritional and lifestyle recommendations to benefit the health of men. Prostate cancer is more common in men over the age of 50. And about 6 in 10 cases of prostate cancer are found in men over the age of 65. It has been suggested to run in families. In fact, having a brother or father with prostate cancer more than doubles a man’s risk of developing prostate cancer himself. Some studies have suggested that inherited mutations of the BRCA1 or BRCA2 genes (seen in families with higher risks of breast and ovarian cancers) may increase the risk in some men. Though these genes most likely account for a smaller percentage of prostate cancer cases. It remains unclear how big of an effect diet has on the development of prostate cancer, although a large number of studies have found that diets higher in red meat intake, dairy products and diets high in total fat increase a man’s chance of getting prostate cancer. A study performed in Canada found that a diet high in saturated fat was associated with a “3-fold” risk of death following a prostate cancer diagnosis[i] when compared to a diet low in saturated fat[ii]. Conversely, diets consisting of fiber-rich foods, lycopene (found in tomatoes), and cruciferous vegetables have been shown to be associated with a lower risk of developing prostate cancer. It is important to note that lycopene is more easily digested after cooking, so look for recipes with cooked tomatoes like homemade marinara sauce, tomato soup, and ratatouli. Fish and intake of foods high in omega 3 fatty acids, have been linked to a decreased risk of death and recurrence of prostate cancer[i]. A recent article published in the Chicago Tribune states “men with early stage prostate cancer may live longer if they eat a diet rich in heart-healthy nuts, vegetable oils, seeds, and avocadoes”[iii]. It is because the heart-healthy fats found in nuts and vegetable oils increase antioxidants, which act to protect against cell damage and inflammation[iii]. Eating a very high amount of fruits and vegetables per day, 5-9 servings is ideal and focus on foods darker in pigment, as those tend to be higher in antioxidants. Specifically cruciferous vegetables like broccoli, cauliflower, and kale, as they have been found to have cancer-fighting properties. Increasing intake of omega 3, our recommendations can be found here. However, we feel it’s important to mention that a recent study found a possible link to an increased cancer risk and the digestion of omega 3s. However, the study did not question where the omega 3s came from. Therefore, it remains unclear whether it is omega 3s from food or the omega 3s from supplements increase prostate cancer risk in men. All in all, we recommend eating natural sources of omega 3s in moderation, like eating fish and a handful of nuts a few times per week[iv]. Similar to omega 3 supplementation, medical professionals advise patients to avoid using supplements, unless authorized by their doctors. In 2012 it was found that vitamin E supplementation could actually be linked to an increased risk of prostate cancer. Although this has yet to be definitively proven in studies, many believe that drinking 2-3 cups of green tea could help fight off cancer cells. While there is little evidence to this, we don’t think it would hurt swapping your second cup of coffee with a nice cup of green tea. Exercise has been shown to decrease the risk of prostate cancer reoccurrence. It is recommended that men get an average of 30 minutes of exercise about 5 days per week. What activities do you do with your family to keep healthy and active? What are your favorite recipes with lycopene, cruciferous veggies, and omegas? We especially love this Tomato Soup recipe from Cooking Light! [i] Epstein, Mara M., Julie L. Kasperzyk, Lorelei A. Mucci, Edward Giovannucci, Alkes Price, Alicja Wolk, Niclas Hakansson, Katja Fall, Swen-Olof Andersson, and Ove Andren. “Dietary Fatty Acid Intake and Prostate Cancer Survival in Örebro County, Sweden.” American Journal of Epidemiology. Johns Hopkins Bloomberg School of Public Health, 10 July 2012. Web. [ii] Berkow, Susan E., Neal D. Barnard, Gordon A. Saxe, and Trulie Ankerberg-Nobis. “Diet and Survival After Prostate Cancer Diagnosis.” Nutrition Reviews 65.9 (2007): 391-403. [iii] Cortez, Michelle F. “Healthy Fats May Prolong Lives of Those with Prostate Cancer.”Chicago Tribune: Health. Chicago Tribune Company, LLC, 3 Oct. 2013. Web. 13 Oct. 2013. [iv] Brasky, T. M. et al. Plasma phospholipid fatty acids and prostate cancer risk in the SELECT trial. J. Natl Cancer Inst. http://dx.doi.org/10.1093/jnci/djt174. The American Journal of Gastroenterology recently found that the prevalence of Celiac Disease in America affects every 1 in 141 people. This past spring we featured a blog post explaining the ins and outs of the gluten-free diet. We touched on Celiac Disease, gluten intolerance, and the false idea that gluten-free automatically means weight loss. Now that we all have a better understanding of the gluten-free world, we have some great news to share! Earlier this month, the FDA made great strides in the gluten-free community by officially defining a standard that will apply to foods bearing the gluten-free label. What Will This Mean? Let’s Get To The Good Stuff! Gluten-free labeling has been a bit of a free-for-all over the past few decades. Meaning there was little to no regulation on what classified a product as gluten-free. According to a study featured in BMC Medicine, the gluten-free food industry has expanded to over $2 billion in global sales, as of 2010. With the rapid expansion and lack of regulatory standards, choosing gluten free products could be a rather big risk for those with Celiac Disease and gluten-sensitivities. As we mentioned in our previous gluten-free feature, Celiac Disease has no cure. The only known way to manage the disease is through a strict, gluten-free diet. Andrea Levario, the executive director of the American Celiac Disease Alliance, stated, “not having a legal definition of ‘gluten-free,’ consumers could never be positive that their body would tolerate a food with the gluten-free label.” Therefore, this new ruling is causing many people with Celiac Disease and the gluten-intolerant to rejoice in the safety of the universal standard. We now know that gluten is a protein found in wheat, rye, barley, as well as some contaminated oats and that even the smallest amount can cause symptoms in those with Celiac and gluten-intolerance. The FDA has decided to consider foods with no more than 20ppm (parts per million) of gluten as gluten-free. But, what does the 20ppm mean, you ask? 20ppm is the least amount of gluten that can be found in foods via reliable scientific analysis testing. It is also the level that meets many other countries’ standards for safety. Manufacturers will have until August 5th, 2014 to abide by the ruling. Michael R. Taylor, J.D., the Deputy FDA Food Commissioner, states that while the FDA believes the majority of gluten-free companies already fall under compliance, they urge companies to closely examine their practices, before the one-year mark from the ruling3. While the FDA will not be testing these products before they hit the market, if a food item is found to violate the ruling, the item will be subject to an official FDA investigation, and possible suspension. What a month for the gluten-free community! We are pleased that this ruling will allow for a safer shopping experience for gluten-free folks! For more detailed information on the FDA’s ruling, please visit the FDA’s website. Rubio-Tapia, Alberto, Jonas F. Ludvigsson, Tricia L. Brantner, Joseph A. Murray, and James E. Everhart. “The Prevalence of Celiac Disease in the United States.”Nature.com. The American Journal of Gastroenterology, Oct. 2012. Web. 26 Aug. 2013. <http://www.nature.com/ajg/journal/v107/n10/full/ajg2012219a.html>. Sapone, Anna, Julio C. Bai, Carolina Ciacci, Jernej Dolinsek, Peter HR Green, and Marios Hadjivassiliou. “Spectrum of Gluten-related Disorders: Consensus on New Nomenclature and Classification.” BMC Medicine. BioMed Central Medicine, 7 Feb. 2012. Web. 26 Aug. 2013. <http://www.biomedcentral.com/1741-7015/10/13>. “For Consumers.” What Is Gluten-Free? FDA Has an Answer. U.S. Food and Drug Administration, 02 Aug. 2013. Web. 26 Aug. 2013. <http://www.fda.gov/ForConsumers/ConsumerUpdates/ucm363069.htm>. Has your stomach ever rumbled in anticipation of the next meal, even though it may seem like you’ve just eaten a meal or snack? Despite the timing of your meals and snacks, a growling stomach is your body’s way of telling you to grab a bite! Wondering how to stave off hunger and keep those hunger pangs away? A major key to maintaining energy throughout the day and obtaining adequate nutrition to fuel your body and brain is to eat foods that digest slowly. Read on to learn more about the physiological process behind why your stomach growls, and a few key foods that will help keep you feeling fuller, longer! Why Does Your Stomach Growl? So, what’s the cause of the growling sensation? During the digestion process, the food you eat enters your stomach, and is later pushed through your intestinal tract. But before it enters the intestines, the stomach first churns and mashes the food. This process is aided by the walls of the stomach, which are muscular and constantly contract to help circulate the digestive juices. When your stomach is empty, these juices slosh around your stomach; the combination of the gases in your stomach and walls of your stomach contracting..generates the familiar growling sound we hear when we feel hungry. If you focus on eating less, you may find yourself feeling hungry. Rather than eating less, shift your focus on choosing foods that are naturally high in fiber, are a lean source of protein and low glycemic carbohydrates. Incorporate foods that keep blood sugar levels stable and give consistent energy throughout the day. This can help prevent fatigue, headaches, or midday crashes. Note that simple carbohydrates (like cookies, or white pasta) digest quickly and cause blood sugar levels to spike higher than a complex carbohydrate (like legumes or whole wheat pasta) and then drop quickly. Remember, thhough there are no “good” foods or “bad” foods, be mindful of what foods may be a better option to eat during meal times so that you don’t find yourself feeling hungry soon after. Yes..there are certain foods that promote satiety more than others! This way, you’ll still be able to enjoy the foods you like and stave off hunger! 2 Egg White and One Egg Yolk – Adding the one yolk will help to satiate you in the morning. The combination of fat and protein takes longer for the body to break down, therefore helping you feel fuller longer. Oats – This soluble fiber will expand in your body and help you feel more full. Lentils – This low glycemic carb is high in fiber and protein. This combination doesn’t raise your blood sugar. Whole Wheat Pasta – Many people think you need a low-carb diet but the average adult needs at least 135g carbohydrates a day. This is a great way to stave off hunger as long as you pair it with a protein and a fat. Kale Salad – With its fibrous leaves and crunchy stems, kale takes longer to chew, which slows down your eating and gives your body time to gauge how full you are. To create a salad that will help keep you fuller longer, be sure to pair this fibrous green with a fat like sliced almonds for crunch. Salmon – Fatty fish like salmon contain omega-3 fatty acids and provides ample amounts of lean protein, which as a fat and protein combination takes longer to digest. The fat is very palatable on the tongue so its great for people who are looking for a food to pair with greens and whole grains. Low-Fat Greek Yogurt – Creamy and tangy, Greek yogurt is a rich source of calcium, low in sugar and high in protein. It helps slow the digestion of other carbs during your meal. It does not negatively affect blood sugar or zap your energy like a regular yogurt might. Enjoy it on its own, mix with wheat berries and a dash of cinnamon, or simply top with fresh fruit. Olive Oil- Not only does this healthy fat help us to feel full, but also research shows that those who follow the Mediterranean diet are associated with having a smaller waistline. Hydrate with H20 – Increase your water intake by consuming a glass before, during or after your meal. Often, people can mistake hunger for thirst, which leads to people eating when they are actually not hungry. Drinking water throughout the day and during meals can fill up your stomach and help you feel satiated. Chia Seeds – Chia seeds are an excellent source of fiber (~10g in 2 tablespoons) and expand in the body to help you feel more sated. With a neutral flavor, these seeds can be added to almost any dish. They are rich in polyunsaturated fats, especially omega-3 fatty acids (ALA). Sprinkle over steel cut oatmeal or low-fat Greek yogurts, or mix into nut butters or blend into smoothies. For more foods that may help keep you fuller, longer, check out Laura Cipullo’s tips here. Is Greek Frozen Yogurt Everyone's Answer to Dessert? In the past few years, frozen yogurt has become an increasingly popular food. With its creamy texture, thick consistency, and boasting more protein than regular yogurt, it’s no surprise that Greek yogurt has expanded to a wide variety of products on the shelves. From shelf stable products like cereals or covered pretzels to Greek frozen yogurt ice cream, are the commercial products that contain this tangy yogurt just as healthy as Greek yogurt itself? Read on to find out if Greek frozen yogurt is everyone’s answer to dessert! The processing, flavor, and nutrition content of Greek yogurt differs greatly from regular yogurt. Greek yogurt has been strained, and the whey is removed; which yields a thick and creamy product. It is also tangier than regular yogurt. Its thick consistency allows for it to easily act as a substitute for many ingredients. For example, Greek yogurt can be used as a substitute for recipes that call for whole milk, sour cream, or even cream cheese! (Try Fage non-fat, plain Greek yogurt for a healthier alternative to cream cheese. It’s thick consistency allows it stay in tact yet spreadable on toasts!) Compared to regular yogurt, most Greek yogurts have higher protein and calcium content and lower added sugar content. Note that calcium content can vary depending on the brand and flavor of the yogurt. When food shopping, check the back of the nutrition label to see the percentage of calcium that the product contains. Typically it can vary from 20-50% calcium. From the information above, you can see that Chobani non-fat Greek yogurt has the least calories as well as the most protein. Instead of focusing on the calorie content however, note that the protein content is what really sets Greek yogurt apart from the frozen products. The protein will increase satiety—essentially helping to keep you feeling full, longer—and it won’t spike your insulin. Compared to its frozen counterpart, this makes Greek yogurt a great everyday food choice for those who may have diabetes or are insulin resistant. And if you’re looking to reap the health benefits of Greek yogurt, enjoy it straight from the container or use it as a healthy alternative for recipes like salads, dips, and even cheesecakes! It’s important to recognize that while Greek yogurt itself can be a nutritionally dense and tasty food, know that not every Greek yogurt product is going to have the same nutritional value. Unfortunately, the labeling of the product as “Greek frozen yogurt” may create a perception that it provides the same benefits as regular Greek yogurt. Products that claim to contain Greek yogurt (whether frozen or shelf stable) often contain added sugars like syrups or candy pieces, and fillers, which increase the saturated fat and dwindle the amount of Greek yogurt that is actually in the product. Despite the differences between Greek yogurt or Greek frozen yogurt, the takeaway is that it is perfectly OK to enjoy Greek frozen yogurt (or simply ice cream!) sometimes as a snack or dessert. Remember, here at Eating and Living Moderately, we believe in enjoying all foods in moderation and balance! So over the past two weeks, I have been asked to comment the positive effects of eating peanut butter at breakfast and the positive effects of eating a large breakfast. I think most people know the saying of “Breakfast is the most important meal of the day.” However, I know most people skip breakfast or just eat a very skimpy one. Here at EALM (Eating and Living Moderately), we are all about eating especially the fats known as monounsaturated fats (think olive oil and peanut butter) and definitely not skipping meals– so this new research was music to our ears! Read on to get a quick and easy take away from the research I discussed with Jenna Lee on Happening Now. What you eat in terms of carbs, fat, protein, plus calorie content of that meal and time of day may help weight loss and waist circumference in women needing to lose weight as determined by their physician and dietitian. This may also be a great preventative concept for preventing insulin resistance and diabetes. To note, overall both groups in this study had favorable results such as lowered blood sugar, decreased insulin resistance and decreased production of the hormone that stimulates appetite, but the group that ate the higher calorie breakfast/low calorie dinner (vs. the low calorie breakfast/high calorie dinner) had the better results of both groups. Just so you know, the women’s breakfast was 700 cals, lunch 500 cals and dinner quite small at 200 kcals. I am not recommending a 200 calorie dinner; however, consider eating more earlier in the day and then assessing how you feel come dinner time. You may be less hungry than normal. In addition we already know that eating more in the am and throughout the day decreases the likelihood of binging. Eating in this order proves to be more helpful than eating in the reverse order which most Americans seem to do. The larger breakfast helps to keep your insulin, blood sugar, TG, bad cholesterol and appetite hormone ghrelin lower throughout the day thereby making you less hungry, less likely to crave and less likely to deposit fat around the belly. *Note: Keep in mind such a low calorie diet was for women with metabolic syndrome, not necessarily you, the reader. I would expect the carb:protein:fat ratios at each meal time also greatly affected the results of this study. And, we can’t forget that this study is suggesting that eating early in the day, consistent with our circadian paths helps to increase rate of thermogenesis (energy we use to metabolize food). Perhaps you may want to start your day with a more nutritionally dense breakfast = 30% protein, 25% fat, and 45% carbs. If you’re trying to follow this pattern, let us know if you feel less hungry at night. Most people are confused about whether nuts are good for you. In the past, nuts have gotten a bad rep for being a “bad fat.” However, nuts are high in vitamins, minerals, protein, fiber and fat, and a handful of nuts go a long way. These bite sized powerhouses are in fact highly nutritious and beneficial to the body. All nuts have different nutrition profiles and offer different benefits. Read on to find out which nuts are rich in calcium or boast the most protein per serving. If you’re allergic to nuts, seeds are similar in flavor. They offer a nutty taste and crunchy texture without the health risk. Although nuts are a healthy choice themselves, like all foods, too much of a good thing isn’t always healthy. Nuts are small but are more nutritionally dense in both fat and calories. So, keep in mind that while a handful of nuts can be a healthy snack choice between meals, too many handfuls may ruin your appetite altogether.